If you like football and alcohol, you'll get a lot out of this awesome drinking game! This game is a one-on-one table football penalty shoot-out, and the loser takes a shot - tense. huh? The best thing about this Mini Football Table Shots Game is that it can be played anywhere - so as long as you have a suitable table to play it on, that is. The concept of the game is simple: it's basically a one-on-one version of table football, but each goal has a shot next to it; if you score a goal the other player has to take a shot - see, simple. If you are into table football and fun drinking games you will adore this barrel of laughs. 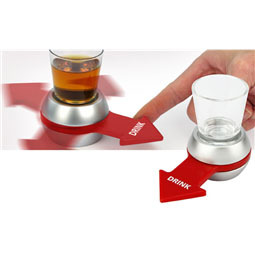 This Mini Football Table Shots Game is ideal for those of us who like to indulge in fun drinking games! Sometimes, just drinking on its own is not quite enough, so it pays to throw a massive entertainment factor in there. With a game like this you have to work to keep yourself sober, and more importantly, you can work to get your mates utterly annihilated!